Some were really surprised that it’s my first time to Singapore. A lot of people I know absolutely adore it and I can understand why. It’s clean and modern and bright and systematic. People are nice and everyone speaks English. It just never interests me much because it’s a young country, hence, not so rich culturally and it’s too expensive for shopping. It has more shopping malls (beautiful ones!) than Manila. But I’ve also always said that if I’ve never been there, I’d want to go there. So I know that one day I’ll come to Singapore, given a good reason. I’ve actually been looking at Singapore Airline when I plan for long haul trips so that I can do extended stop over. Turned out I didn’t have to wait for that. 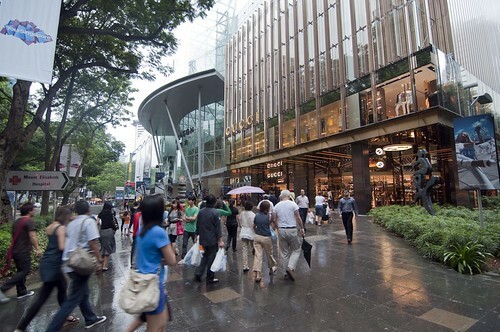 We explored Orchard Road (where we’re staying) on day 1. This actually means, checking out shopping malls – Takashiyama, Paragon, Wisma Atria, Tang, and newly opened ION Orchard. 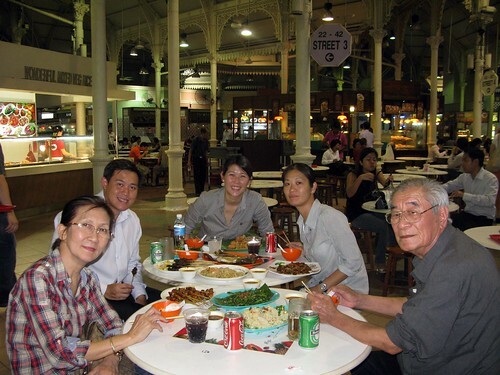 Then we met up with my little cousins who are all grown up now for dinner. It’s an interesting encounter because even if I’ve known them as babies and children, I didn’t really know them so it’s quite nice chatting with them as adults. And the wonder of facebook made us less stranger so we’re quite updated with each other’s life and easy to go on from there. Jhon and I have scuba diving in common and photography with Pei. Really cool. Day 2 we went to Universal Studio Singapore. I decided to take them there instead of the zoo or night safari because it’s the thing now and my mother would love to tell people she has been there. I bought our tickets online and it’s quite painless getting there, as with everything else in Singapore. Regular ticket costs SGD66 and senior/child ticket costs SGD32. The tickets are inclusive of entrance, shows, rides, SGD10 meal stub, and SGD5 souvenir shop stub. Other ticket variations include express pass (if you’re impatient) and annual pass. It was interesting that the news headline that day, March 26 was Universal Studio popular new ride Battle Star Galactica was shut down due to technical glitch. Not that I plan to ride that with my parents anyway. 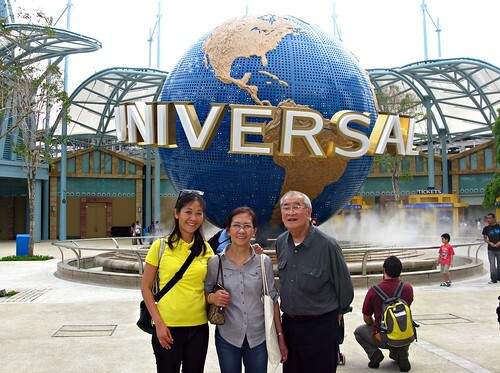 Universal Studio Singapore is part of the huge Resort World in Sentosa Island. It’s like a petite version of the one in L.A. It has some new attraction that I didn’t see in 2004 (in L.A.), like the battle star galactica ride and Steven Spielberg’s Lights, camera, action! But it also has the familiar Waterworld show which I think is the most impressive production. The park was divided into, from my memory, Hollywood, New York, Far Away Land (Shrek), Jurassic Park, Egypt, Future. I believe you can do everything in one day, even if we didn’t.